We had some good to great chinook fishing from Nanaimo down to Gabriola earlier in the week when the winds allowed us to get there on our 10-hour trips. It is great to see so many chinook around in these areas almost into mid July. I have to say; the chinook fishing in general has been stellar this year starting in April, all the way until now, except for a bit of a slow period late June. If you step back and look at the season as a whole up to today, it has been an amazing April, May, June, and first half of July. I realize there are some chinook stocks of concern in other areas of the Pacific, but I would argue these local stocks are doing fine if not great. I hope DFO takes notice…. Shannon’s fish from yesterday weighed in at 26lbs. Nice fish Shannon! Unfortunately the winds don’t look good for getting across in the foreseeable future with sunny skies and NW 15-25 dominating the forecast. If they happen to get the forecast wrong or the wind warning drops, I would recommend making the crossing and fishing the structure around Gabriola in 150-225 feet of water and keep your gear close to bottom. I have been doing well with a Gibbs Lemon Lime flasher or Gibbs STS flasher with green glow hootchies or cuttle fish hootchies. 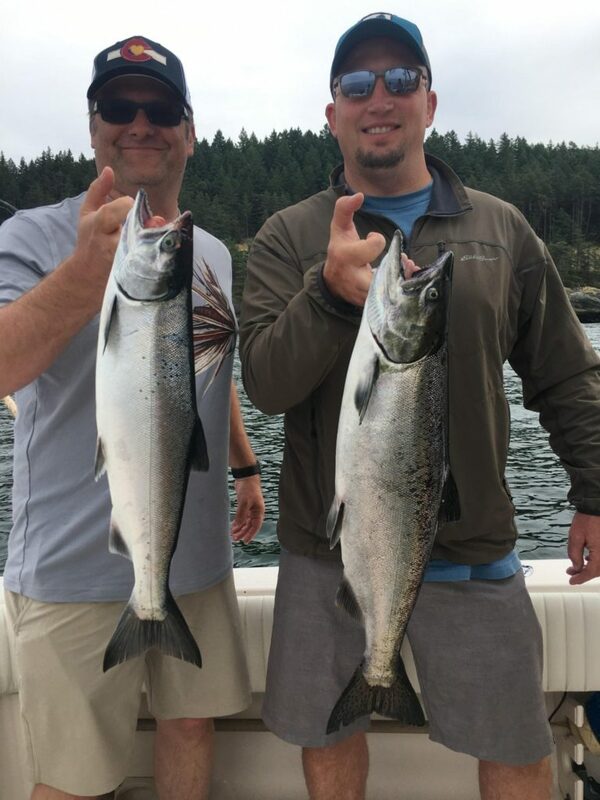 A couple of nice chinook Jason got at Thrasher earlier this week with plenty of other nice ones released. Speaking of good fishing, how about this coho fishing? What a pleasant surprise to see good numbers of coho in the Strait of Georgia from the Gulf Islands all the way over to South Bowen. It seems a lot more hatchery fish have showed up this week as well. A good place to start would be the Hump and we have been doing well out there when the winds allow. Its seems from the surface down to about 100 feet on the riggers has been the hot zone and white hootchies have been excellent or any version of that with a bit of red or pink in it. 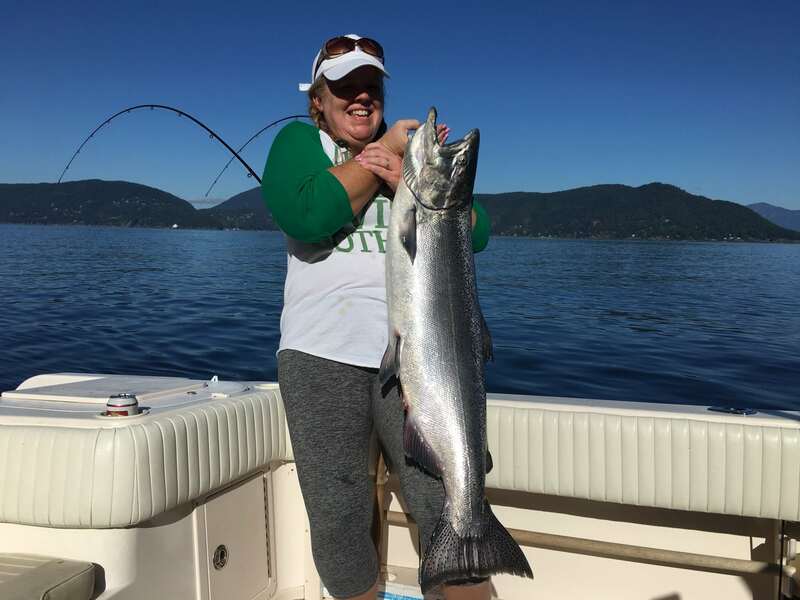 There have been a few chinook around South Bowen as well, but the better action has been for the coho with the chinook catch almost being incidental. With the big NW winds it will be pretty rough out off the Hump or South Bowen so make sure you check the winds before you head out. If you are looking for some refuge from the wind you could try Howe Sound and fish some anchovies 80-150 on the riggers around Hole in the Wall and hope for some chinook. There has been a few coho as well, but usually a bit further off the rocks out in 500 feet. Another good option for coho is West Van shoreline. 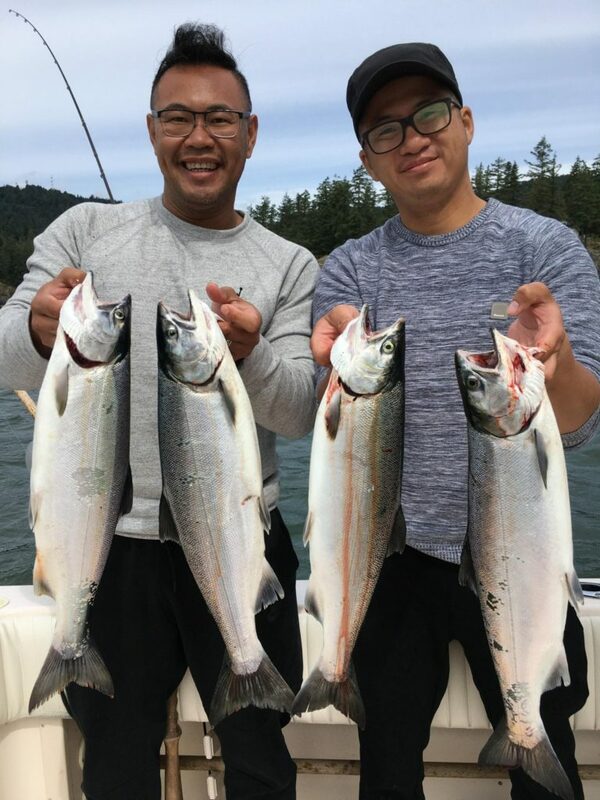 There have been a few coho caught there each day for the past few weeks now, nothing red hot, but there have been some fish there consistently. I expect this area to pick up in the back end of July as these schools of coho off South Bowen move into the harbour. 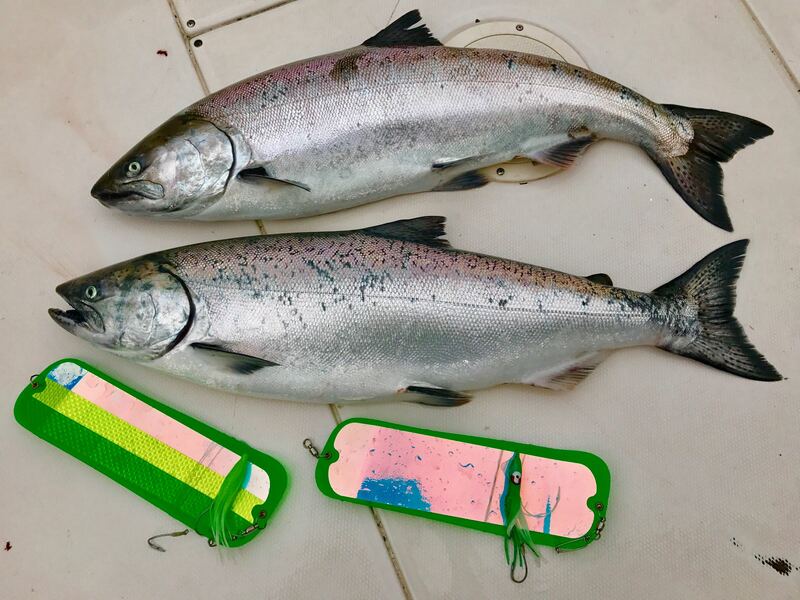 There has been a decent number of chinook entering the Fraser as well if you keep track of the Albion test sets and there has been a few chinook hooked off the Bell Buoy. 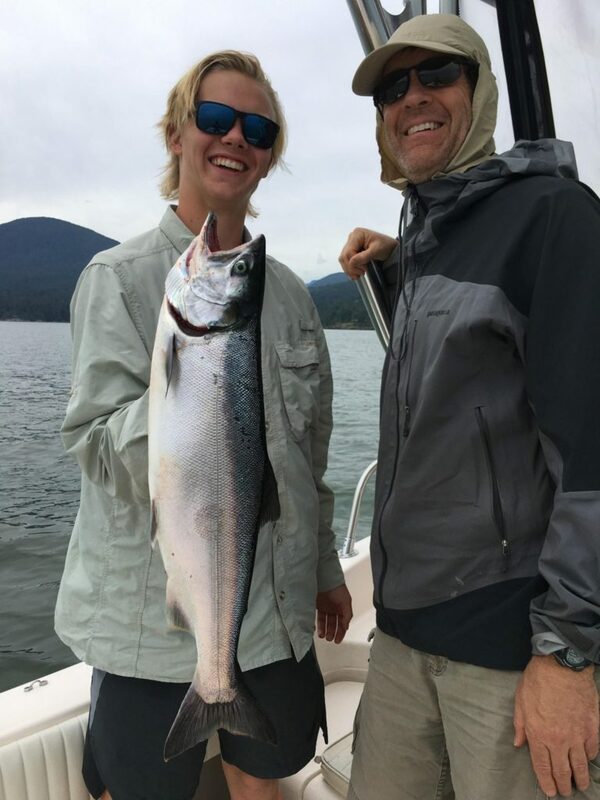 It is still early for this fishery but if you are looking for some chinook, this would be a good option. Bait is the way to go and fish 30-70 on the riggers. Crabbing is slowing down, as the commercial fishery has been open for about a month. The more popular spots are now full of undersize, but if you set where the commercial traps aren’t there are still a few keepers around. Prawning has been decent as it seems the commercial fleet didn’t get as many as they usually do, so if you have a few prawning spots under your belt that usually produce in the spring, you might want to give them a try for some summer time BBQ prawns.